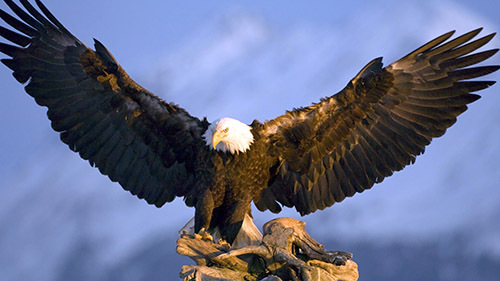 The American Eagle Foundation is located in Pigeon Forge, TN and regularly conducts educational birds-of-prey presentations and educational Bald Eagle appearances at events in Sevier County and the surrounding East Tennessee area. The AEF conducts school programs in Sevier County, TN without a donation fee. Other event types and events and programs in Sevier County and the surrounding East Tennessee area may require a donation to cover staffing costs, travel, and bird care costs. Out-of-state requests (non-Challenger requests) are discussed on a per-situation basis depending on the number of birds requested, staffing needs, and driving distance. What are the Birds Of Prey Program responsibilities of the AEF? Upon request and dependent on availability, many raptor species can be represented, including a Bald Eagle, Golden Eagle, Red-Tailed Hawk, Harris’s Hawk, Barn Owl, Great Horned Owl, Peregrine Falcon, Barred Owl, Screech Owl, American Kestrel, Turkey Vulture, and Black Vulture. Some birds may perform a free-flight demonstration. The AEF will provide a 30-minute Birds Of Prey Program and an approximate 15-minute question and answer period. Upon availability, the AEF will provide Bald Eagle fact sheet handouts. What are the Birds Of Prey Program responsibilities of your school/veterans home/workplace? You will provide a gymnasium, venue, large indoor area, auditorium or classroom in which to present the AEF Birds of Prey Program. In addition, you will provide the use of two tables (approx. 3’x6′) and a public address system,if needed. Projectors are beneficial as we can incorporate short educational videos into the presentation. You will make two staff persons or individuals available to help the AEF staff set-up and load-out. Students and individuals attending the bird program will be seated in the designated program area about 15 minutes prior to the scheduled program. If a school program, school representatives will supervise during the program. The preferred times to schedule programs are at 10:00 in the morning and at 2:00 in the afternoon, but we are willing to adjust this desired schedule if necessary. What will an AEF Birds Of Prey Program cost? The cost of the AEF Birds of Prey Program will vary depending on several factors. Whenever feasible, the non-profit AEF makes every attempt to provide free programs to schools, after-school programs, veterans homes, and nursing homes within Sevier County and bordering counties. Programs at other venues not listed in the previous list-item (i.e. a workplace), whether within or outside of Sevier County, may require a donation to cover bird-care, travel, and staffing costs. For programs at schools more than 50 miles from the AEF may require a donation to cover bird-care, travel, and staffing costs. Call the AEF at 1-800-2- EAGLES for more details about program costs. How can businesses benefit by sponsoring an AEF Birds Of Prey Program at local schools? Many schools have limited budgets and may not be able to afford the cost of bringing in special educational programs. Local businesses are often asked to step forward and help sponsor the AEF Birds Of Prey Program at schools. Schools can enlist the help of business sponsors that are already friendly to and supportive of their efforts. Sponsors and schools are encouraged to invite local newspaper and TV media, and business sponsors are invited to have a representative of their company attend and introduce the program.